Tired of the same, old burger chain you go to every Friday night? You keep telling yourself you're going to try that one place you always drive by on the way to work, but change terrifies you. It's time to step into the glorious kingdom of the burger haven in Pinellas County. There's something for foodies and regular joe's, alike. You won't regret trying any one of these mouth-watering and delicious masterpieces. Here's ten fantastic places you have to try when you're looking for the best burger in the 727. Ozona Blue- Try the 1# Burger ($13.95). It's two 8oz patties, topped with cheddar and jack cheese, smoked bacon, lettuce, tomato, mustard, and mayo. Served with your choice of coleslaw, french fries, black beans, and rice or potato salad, this delight will stop you in your tracks and make you rethink everything you thought you knew about burgers. Plus you can take a dip in the pool--wait 30-minutes of course-- or relax in the hot tub to help digest that delicious burger. The restaurant is tucked between boat warehouses, so you can see yachts being moved into the water while you eat. The Avenue Eat + Drink-Try the Good Morning and Good Night ($14). Located under a mile away from Tropicana Field, The Avenue has a burger for day or night games. Bourbon bacon onion jam, sunny side egg, American cheese, waffles and maple syrup. Yes, please. So grab a booth and have breakfast and dinner at the same time. Come for the burger, stay for the lodge-type atmosphere, TV's and outdoor patio area. The Avenue also serves alcoholic beverages in Mason Jars to really stay on #brand. Engine No9- Try The Heart Attack ($13.25). It's topped with a fried egg, three slices of American cheese, four slices of bacon and plenty of chipotle sauce for that little extra spice in each bite. Engine No9 is run by Jason Esposito, the son of Hockey-Hall-of-Famer Tony Esposito and nephew of Hall-of-Famer and Tampa Bay Lightning co-founder Phil Esposito. There are over 20 different burgers for you try, and you can pair it with more than 60 beers for the perfect assist. It's the best heart attack you'll ever have. Grind House Bar & Grill- Try the Guinness Burger ($9.99). The burger is topped with sauteed onions, Guinness gravy--yes, there's Guinness in the gravy--provolone cheese and extra Guinness gravy on the side to dip the burger and chippies (french fries). It's the not signature burger of the Grind House but, it is a personal favorite and that's why it makes the list. On Friday's they hold Trivia Night from 8 p.m. to 10 p.m., so stop in, grab a nice stout and a thick and juicy burger and enjoy being transported to England for 1/16th of the price. Palm Pavilion Beachside Grill and Bar-Try The Famous Palm Burger ($9.50/$10.50 with cheese). You've spent the entire day at the beach, you look like a lobster from the sun and have sand in places you didn't even know existed. 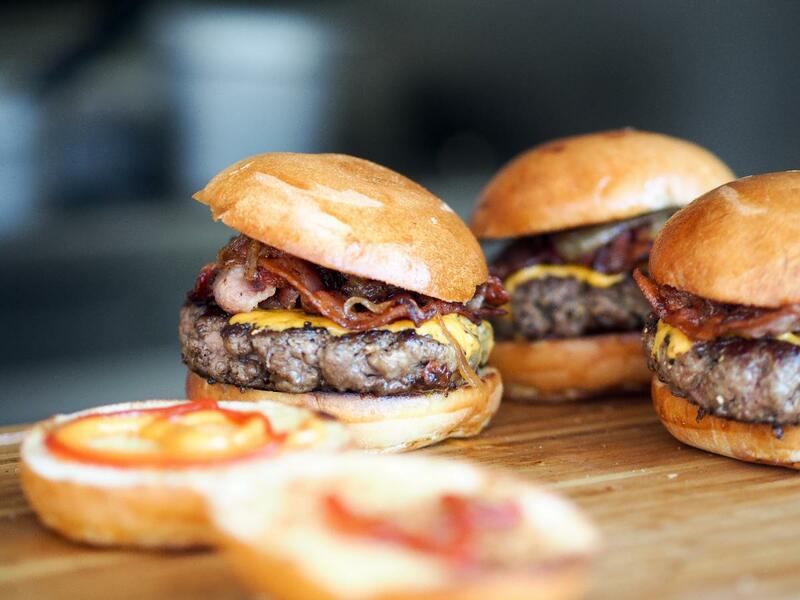 You're not cooking, so why not head to Palm Pavilion for their signature burger? It's made with their private blend of Angus beef served on a toasted brioche bun with lettuce, tomato, and red onions. You can add cheese and bacon for $1 extra each. There's live music nightly and you can watch the sunset as you devour your burger. Willy's Burgers & Booze- Try The Big Gooey ($7.17). The burger is made with 10 ounces of Angus beef and is hand-pattied with their secret blend of herbs and spices, and is one of the best bargains on St. Pete Beach. It's the cheeseburger version of the Willy's Big One and in one man's opinion, cheese is a requirement on any burger that wants to be the best. Willy's doesn't take itself so seriously, from the "Beware of Attack Waitress" sign to the "Drink 'til He's Cute" sign. "Willy's serves comfort food at its finest; simple with no frills, yet never lacking in quality." Eddie's Bar & Grill- Try the Ridiculous Burger ($16). There's never been a more aptly named burger than this one. It starts with a hand-cut piece of Angus beef with ham. Throw on two fried eggs, Swiss cheese, bacon and bleu cheese and you've got yourself a pretty ridiculous burger. BUT THAT'S NOT ALL. The burger is then stuffed between two grilled cheese sandwiches. Whaaaat?!?! If your arteries weren't clogged before, they will be after you struggle to finish this ridiculousness. Have 911 on stand-by, but enjoy every last calorie. 1933 Pub and Grill-Try The Drifter ($10.50). Everyone has opinions about pineapple on pizza (NEVER), but what about pineapple on... a burger? At 1933 Pub and Grill, that's what you'll get from The Drifter. Grilled onions, bacon, coleslaw, and Swiss cheese join the grilled pineapple atop the 8 oz handmade Angus beef burger. It's an interesting and delicious way to delight in pattied beef. Sea Dog Brew Pub Treasure Island-Try The Drunken Burger ($15). Made with Angus rib-eye beef and served on a brioche bun and topped with bourbon bacon jam, IPA -braised onions, Sea Dog beer mustard and Dakin white cheddar. This Sea Dog Brewery just opened this Halloween, but is getting rave reviews for their burgers. For the more health conscious, you can sub the beef for a grilled chicken breast. Boulevard Burgers & Tap House- Try The BLVD Burger ($9.95/$10.95 with cheese). It's an 8 oz burger made of a blend of brisket, Angus chuck and short ribs, served on your choice of brioche, potato or sesame bun with their famous sidewinder french fires. You can make it a double for just $2.95 more. Located on St. Pete Beach, it has an indoor seating area as well as open-air dining so you can smell the sea air while you eat and drink. Conveniently located within walking distance to Postcard Inn St. Pete Beach so you don't even need a car. Want to find more Things to Do in St Petersburg, Dunedin & Clearwater? How about the best resource for Events, Restaurants and more? Stay connected to all things St. Pete by registering at 727area. Your subscription is free!